Returning to Bedlam: Good Night, Gorilla? 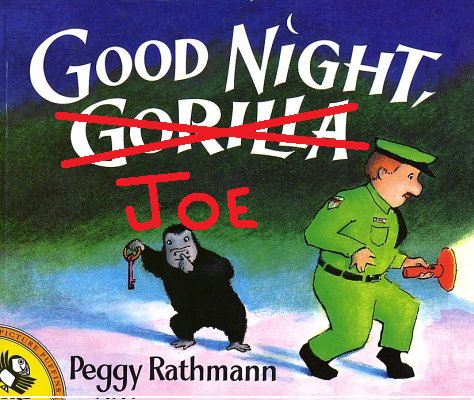 When Joe the zoo keeper made his nightly rounds he never felt the gorilla slip his key ring off of his belt. “Good night, gorilla,” he said, as he walked past the cage. He never heard the gorilla insert the key into the lock on his cage door. He never heard the key turn in the lock. He never noticed the grating metallic squeal as the cage door swung open. Why should he? Strange sights and sounds were common to the zoo keeper with the DT’s. They were nothing that a little nip before bed couldn’t fix. The gorilla followed him to the elephant cage. “Good night, elephant,” the zoo keeper mumbled, as he walked past the cage. The gorilla held open the cage door as the young pachyderm made his silent escape. They both followed Joe to the lion cage. The lion looked up from the bone he was gnawing as the fat, old zoo keeper walked by. “Good night, lion,” Joe offered, unaware of his impending doom. The gorilla unlocked the lion’s cage door. Sensing the cat’s energy, young Kong nimbly scampered up the outside of the lion’s cage to safety. Dumbo lowered his head, ready to fend off any unwanted feline advances, but the young cat paid them no mind. He sprang from his cage, mauling the unsuspecting Joe from behind, and promptly started digging for a fresh bone to chew. Two cages over, the hyenas laughed. A little bedtime reading for the kids? After reading this a dozen times, we needed a new ending. It cut off a few pages, too! Loved it. Guess that makes me twisted too. Yet another of my kids' favorites ruined for me. Loved the original. Love the adaptation, too! I love the adaptation! Much better than the original, and more realistic.